. :: Huong Thien :: Hoi VBVN :..
That night, I couldn't sleep. The entire night, I kept thinking: “My people are so unfortunate.” The poor, the handicapped, the starving -- how many are deprived of normal life in Vietnam ? So many lead such painful existences, with their future under a dark cloud. In Saigon , life is a constant excitement. The city is full of motorcycles, a celebration of noise. There are rich folks who are becoming richer; and there are poor people whose livelihood is worsened. A boy selling lottery tickets sang a sad song. I walked along the street thinking of my lost youth, and I smiled to myself. Tomorrow, early morning, we're going to a very distant town, Pleiku, my hometown. All of us drove out to a little town called Phu Bon. On the way, we listened to the doctors' stories. A few have been working for four decades, other a few years. All will tell you that each time they operate it's an emotional experience. To the blind, they are saints who literally restore sight. What they do seem like miracles to the uneducated rural population here, who believe that the gods took away their sight. They could not believe that someday they could see again their beloved Se San waterfall, which they hear roaring down from the Gia Ly Mountain. Two hundred operations in Gia Lai province were performed among a population of 1,385 who suffered from cataract blindness. Our organization paid for 1,000 cases to be performed. 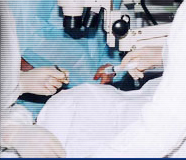 It takes around 15 minutes for each operation for the patient's life to change radically. Those who were operated upon started to cry when they began to see again. Their happiness is indescribable. After so many years of not being able to see, now they could. They all wept. Even the doctors were teary-eyed. Ms. Van and Mr. Le, two people who joined me on this particular trip, couldn't hold it back and they began to weep. Mr. Lam too spoke in a choked up voice. “I want to help pay for more operations. How unfortunate these people are.” Mr. Chanh Nguyen saw me struggle with my own emotions and he said, “Come on. Let it out,” and I grabbed and hugged him and we both cried. I felt intense happiness for those who got to see again. I thought of our motto -- “Providing the Source of Light” -- and thought, “How true, what we do.” But I felt that those who helped were just as happy as those who were being helped. Since then, six months have passed, and our charity, “The Vietnamese Association for the Blind in Vietnam ,” was founded in Northern California . It began with many of my close friends who gave money. Some gave a few hundred dollars. Others gave ten thousand. We all want to “Provide the Source of Light” to the remaining 350,000 Vietnamese in Vietnam who suffer from cataracts that are operable. Our aim is $1.1 million. We will work with The Society to Support the Poor in the hopes of reaching those who suffer from cataracts but don't have access to health care and are too poor to pay for their own operations. We aim to go to poor towns and provinces like Tuy Hoa, Quang Ngai, Quang Tri, Hue , and Phan Rang, then eventually the entire country. We hope to achieve this goal in five years. We hope to find people who share our hope. Đêm quyên góp cho nạn nhân Sóng Thần vùng Đông Nam Á với American Red Cross. Đêm thắp nến cho những nạn nhân của cuộc khủng bố 9/11/2000 tại New York. Quyên góp cho nạn lụt tại miền Tây Việt Nam. Quyên góp cho nạn lụt tại miền Trung Việt Nam.